Use the code PCG to knock 20 percent off ticket prices. The PC Gamer Weekender offers multiple opportunities to play games and learn about the hardware side of PC gaming, but it also offers a combination of the two thanks to Irregular Corporation’s PC Building Sim. The game will be playable during the Weekender, and allows players to build their very own computer repair enterprise. Featuring licensed components from the real world, realistic price ranges and a comprehensive simulation of hardware and software, the sim allows you to bring your ultimate, dream PC to life. 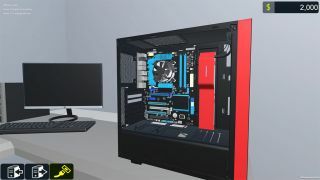 You can find out more about PC Building Sim over on its official site, via Twitter and Facebook, or by staring directly into its Steam page. The Building Sim will be joined by many more speakers, games and booths all at the PC Gamer Weekender, which is being held February 17-18 at the Olympia, London, in the UK. For more details see the site, and follow us on Twitter for up-to-the-minute news. Tickets are available now from £12.99. Use the code PCG to knock 20 percent off ticket prices.